Digi-Schlock: ALIEN OPPONENT (Shout! Factory DVD) – Schlockmania! Though they have become known to genre fans for their reissues, Shout! Factory has been known to dabble in releasing recent films for the genre market. 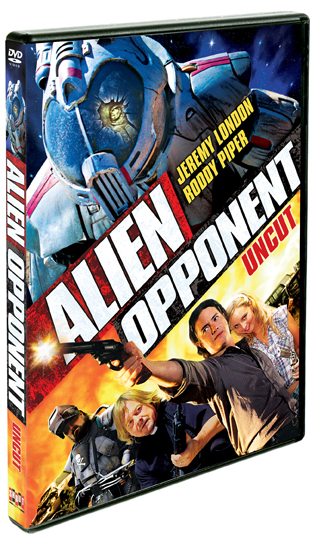 Alien Opponent is the most recent example, a DVD of a film originally made for the Chiller cable network. The result is a typically professional package that does well by the televised b-movie it contains. Alien Opponent is presented in an anamorphic transfer that lends a nice look to its digital video imagery. In an unusual choice for a television movie, it was shot in the 2.35:1 ratio and the results are colorful and well-detailed. The disc also features a 5.1 stereo sound mix that works up a few decent surround effects for the listener and offers a well-balanced blend of dialogue, effects and music. A few extras have also been assembled for this disc. First up are a few sets of extra footage. The deleted scenes total up to about seven minutes’ worth of stuff that amounts to trims from scenes in the film rather than complete scenes. The outtakes reel runs around three minutes and is your typical collection of flubbed lines. An outtake with Roddy Piper is the funniest of the bunch – which is fitting since he gives the film’s best performance. There is also a commentary track featuring director Colin Theys, writer John Doolan and several members of the crew. As is often the case with group commentaries, it’s a chaotic and unfocused affair that is long on rowdiness and short on the details that people who listen to commentary tracks actually want. There are some details about how particular effects were achieved if you stick with it but you’ve got to sift through a a lot of faux-humorous sniping between crew members. The wit of this joke-heavy track is on a par with the film itself, complete with someone playing fart noises via an iPhone app. In short, a viewer’s interest in Alien Opponent will depend on their interest in Troma-derived antics and made-for-cable b-movies – but if you like all of the above, this disc offers a solid way to enjoy such cheap thrills. To read Schlockmania’s film review of Alien Opponent, click here.